The so-called pip count is an inexact method of determining which side is ahead, and by how much, after all contact between the sides has ceased — that is, when both armies have maneuvered their forces beyond one another and there will be no further contact by either side. To determine your own and your opponent’s pip count is simple but tedious arithmetic. Any men on your 1 point count 1 point apiece, the men on your 2 point count 2 points apiece and so on throughout the board. There are a total of 24 points, so should you have any men on your opponent’s 1 point, they would count 24 apiece. Obviously there would still be contact were this the case, however, and logically speaking the pip count would not be employed in this instance. At the beginning of the game, each player has a count of 167. When you understand how this figure is determined, you will be able to make an accurate count of both your position and your opponent’s at any stage during the game. Your two men in your opponent’s inner board are 24 apiece, or 48. Your five men on his 12 point are 13 apiece, or 65. The three men on your 8 point are 8 apiece, or 24, and the five men on your 6 point are 6 apiece, or 30 — making a total of 167. Conversely, tend to take a double if you are less than 20 pips behind and perhaps drop if over 20. We say “perhaps,” since we naturally dislike dropping in these positions. There is no chance of a double game, and the game still has a long way to go. If both sides are between 90 and 100 pips, you should be at least 13 pips ahead to double; between 80 and 90, 10 pips ahead; between 70 and 80, 7; and between 60 and 70, 5. When both sides are under 50 pips, the basic fallacies in the pip count begin to become evident. We do not recommend using the pip count at all, but particularly when the count is under 50. The amount of time and effort it takes to add this, that, and these; to make the same computations for your opponent; and then to subtract one from the other in order to decide whether or not to double, addles the brain and depletes energy that could be put to better use determining tactics and strategies in the ensuing game. Make no mistake, when you begin to take backgammon seriously, stamina — both mental and physical — becomes a salient requirement, and the pip count is a particularly exhausting and essentially useless form of mental calisthenics. In baseball terms, it is a bit like requiring the pitcher to warm up between innings. As it is, the astute backgammon player is making enough continuous calculations without resorting to additional arithmetic. The basic fallacy of the pip count can be shown in many ways. Consider the position shown in Diagram 73. White has two men on the 1 point, two on the 2 point and two on the 3 point, for a pip count of 12. Black has two men on the 3 point and four men on the 1 point, a pip count of 10. If it is white’s roll, there can be no argument that black should refuse the double. But if it were black’s roll — remember that he is 2 pips ahead — and he doubled, white would have a clear-cut take. If black rolled any 2 except double 2’s, white should even redouble. In other words, with only three rolls or less remaining in the game, white, who is behind in the pip count doubles and his opponent must drop. And in the same position, if the pip-count leader doubled, his opponent would have to take. This example also shows that when bearing off the even diversification of your men in your inner board is infinitely more important than the pip count. 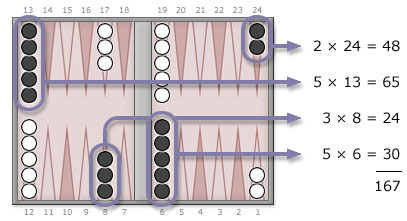 In Diagram 74, black has two men left on his 6 point, a pip count of 12, and white has three men on his 1 point, a pip count of 3. Black is 9 pips behind, it is his roll, and he has a mandatory double. So much for the pip count. If you have been playing backgammon for a long period, you should be able to determine your position and your opponent’s at a glance and know whether or not you are less than 3 to 1 to win. Even so, there are players who continue to use the pip count despite the fact that it is little more than a long detour toward the same goal; it is reminiscent of the awkward counting movements beginners employ when moving their men about the board. Use it if you must, if it actually helps you, but if you learn to recognize the game’s position at any given moment in the match, you will have accomplished a great deal more and in far less time.